A German author, who was born in Glogau in the second quarter of the eighteenth century. After having been a tutor for some time in Berlin, he removed to Prague in 1768, and there followed the same vocation. Early in 1773, while traveling through Saxony, he was arrested on a false charge, and lingered in the prison of Pirna without an examination for ten months. During his confinement he pursued his studies in the Bible, the Talmud, and medieval Hebrew philosophy without interruption. At last he found an opportunity to send a letter in Hebrew describing his predicament to Moses Mendelssohn. Mendelssohn's reply, dated January 13, 1774, was written in German, and, as anticipated, was opened and read by the authorities. When they saw that the Hebrew scholar whom they held in custody was a friend of Mendelssohn, they cleared him of all suspicion and set him at liberty. Through the aid of Isaac Dessau and his relative, R. Hirschel Levin (Ẓebi Hirsch) of Berlin, he was enabled to return to Prague. The first work Abigdor published was an elementary Hebrew grammar entitled "Dabar Ṭob" (A Good Thing), with a table of conjugations, to which he added Moses ibn Ḥabib's "Marpe Lashon," Prague, 1783. In 1792 he edited the first series of letters which Mendelssohn had addressed to him ( ), and in 1797 supplemented it with a second series. This supplement forms the appendix to his poem, "Ḥotem Toknit" (The Perfect Seal), on which he prided himself very much. It is a didactic poem, and aims at proving that the teachings of the Bible surpass all the systems of philosophy ever invented, from Socrates to Kant. It does not, however, deserve the name of poetry: it is nothing but a string of feeble arguments couched in obscure language. The commentary which the author found necessary to supply does not make the poem more intelligible; nor does the acrostic, which gives the name and place of birth of the author, and the date of composition, relieve the poem of its glaring faults—lack of imagination and appropriate diction. 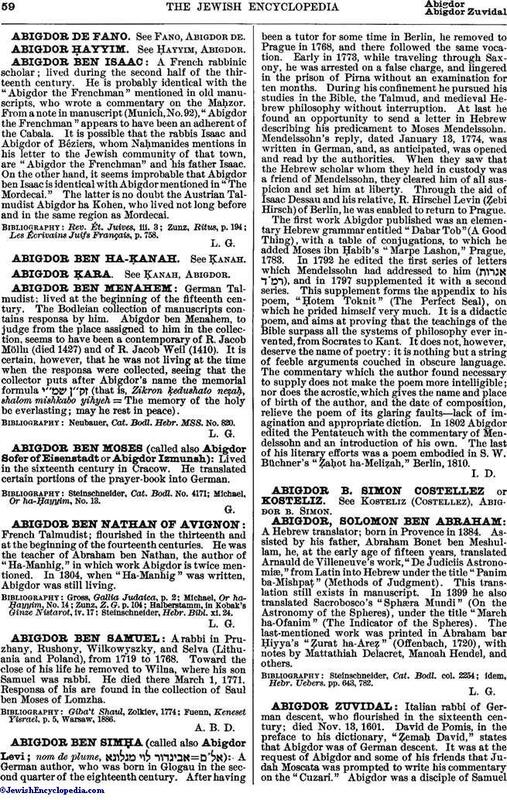 In 1802 Abigdor edited the Pentateuch with the commentary of Mendelssohn and an introduction of his own. The last of his literary efforts was a poem embodied in S. W. Büchner's "Ẓaḥot ha-Meliẓah," Berlin, 1810.